As a child, my mom and I would argue about the above saying. The argument would usually come as a result of her telling me that I needed to relax more and enjoy life. I remember one particular sunny Saturday morning when I was fifteen years old. I was locked away in my room practicing Jimi Hendrix (my favorite Jimi song) and Stevie Ray Vaughan (favorite SRV song) songs on my electric guitar. My mom opened the door and said that everyone was headed to the cottage in thirty minutes. I told her that I wasn’t going. Looking back, I certainly could have taken the day off (especially because I quit practicing the guitar a few years later), but this mentality was part of my life (and, honestly, still very much is.) When you’re working towards a goal, you have to give it everything you have. You have to leave no stone unturned. When you’re building muscle, this is also true. There are many muscle fibers within a single muscle group. Using one exercise to target the muscle group is not enough to fatigue all the muscle fibers. You have to target the the muscle group from different angles. The best way to do that is by using The Bodyweight Omni Set Technique. What Is The Bodyweight Omni Set Technique? “Omni” means “all things” or “in all places”. The Omni Set is a technique that works “all” portions of a muscle group. This technique is a hybrid between a super set and drop set, and focuses on one single muscle group. A super set is when you perform multiple exercises in a row without stopping. A drop set is when you go from a more challenging exercise to an easier exercise that targets the same muscle group. The Bodyweight Omni Set Technique is gruesome and will tear more muscle fibers than when performing a single exercise. In the example below, I’ll take you through an Omni Set for the chest muscle group using an assortment of push-ups. There should be no rest breaks between the above exercises. You’ll immediately move from one exercise to the next. After you make it through all of the exercises, rest for 45 seconds, then go through the sequence four more times for a total of five sets. You’ll have an amazing pump in your chest and you’ll be incredibly sore. 1. Push the floor away. When doing a push-up, think about pushing the floor away from you. 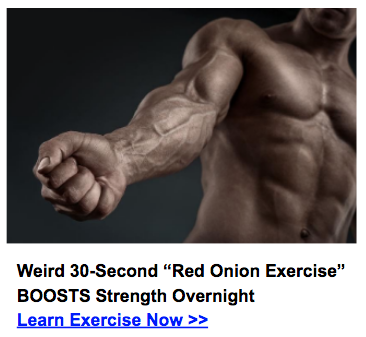 This will help engage more muscle fibers than if you were to simply let gravity carry you down. “Pushing the floor away” is a mental cue, but when you get it right you’ll feel your chest muscles contract even more. Another push-up technique to try is squeezing the ground together between your hands. Pretend that the ground between your hands is a high-tension spring. As you go up and down, squeeze this spring together. This technique requires that you don’t take any rest at all during the movement, especially at the top. Keep the muscles engaged. Keep your focus on the muscle that you’re working. When doing push-ups, if you try to just knock out a certain number of reps, your body will adapt and recruit other muscle groups in order to complete the movement (the triceps, for example). This is NOT what we want. It is important to focus on the muscle that you’re working. When completing the downward portion of the movement, it should take you a total of five seconds. The greatest amount of muscle tearing occurs during the eccentric portion of the movement, so this should be slow and controlled. Do a five second count on the way down, and a one second count on the way up. You should not be worried about how many reps you’re getting. Instead just focus on the eccentric movement and the other principles outlined in this post. This is the first exercise. 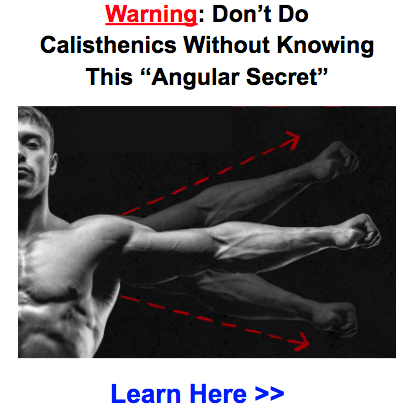 It will work the front part of the shoulder, along with the uppermost fibers of your pecs. This exercise will also work the front part of the shoulders and the upper portion of the chest. However, its a slightly different angle than the pike push-up so it will work different muscle fibers. Lowering your feet a little will change the angle so that more mid-range muscle fibers are worked. Regular push-ups will work mostly the middle portion of the chest muscle group. Placing your hands on a chair or elevated surface will shift the focus to the lower portion of your chest. This exercise will strengthen the lowest fibers of the chest muscle group. Trust me when I say that after doing all of the other exercises, this super high push-up will be challenging. The best part is that it will be working an even lower portion of the pec. After you’ve tried this technique, let me know what you think in the comments section below. Also, remember that the Omni Set Technique can be used for any body part. 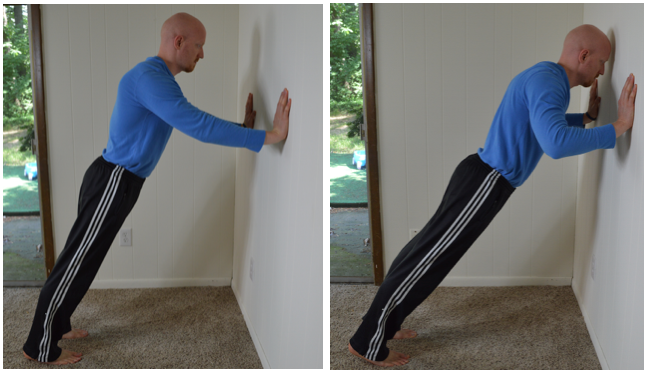 Changing angles is a great way to target different muscle fibers and make bodyweight exercises more challenging. Todd, I’m not sure I understand the workout. How long do I do each push-up? now tome each one, the take the 45 second break? Or is there a time period for each exercise? HI David, You’ll want to do 8-12 reps of each variation without rest in between transitions. You may not be able to get that many reps as you get to the final exercises but do the best you can. You take the 45 second break after the last exercise. Then go back to exercise 1 and work them again. Great. I am going to use it with my BootCamp class next week. I fell and broke my neck five years ago . I also had a brain operation two years ago.. I am walking with a walker . Do you think there is any hope .I lost seventy lbs. I’ve noticed you commented your situation a few times. Honestly, I don’t know your situation and don’t know your goals but I believe that hope is always a good thing. Keep up the good fight my friend. Try to do 8-12 of each variation. Can you structure a whole program around this? Great idea Wolf! I think that would be pretty cool. I’m actually putting together a program similar to Omni sets for the upper body (lower body is much more difficult). Not sure when it will be done but maybe by winter time. As with the other comments, How many reps are we doing and how many sets. Would it be to fatigue with no rest in between and 2-3 sets with a one minute rest between sets? 45 seconds between the full set (not each exercise fyi). You can do 2-3 sets but I recommend higher volume 4-6 sets. However, I have lots of questions, some similar to the other commenters. 1. How many reps/ exercise. Should I go to failure, sub-failure or just a fixed number? 2. How many omni-sets is preferable and with what rest in between? 3. This is just a one workout and is not enough to ellicit a muscle growth response. How does it fit in an overall training plan? Should I do it 3 times/week or more/less? To me it seems like a really good finisher after some lower rep strength workout. Also, not in regards to this article, I wanted to ask you why you don’t have a search fuction within your blog. I find it very difficult to browse to your 400+ posts! 2. Do higher volume (also see above). 3. I would recommend omni sets every single time you workout. I like to splice them in at the end of my workouts. So for example, say you are working out your upper body. You do a series of push ups, planche work, etc. Finish off with 5-6 sets of chest omni sets. Its a great finisher. Yes, form is definitely important. If you can’t maintain form, its time to move on. Feels good. Will incorporate it into pulling sets tomorrow. Just tried it. I really tried to not rest on the up portion of the push-ups. Made it tough! Loved it. Thanks for sharing! Yep, me too Damon! I’ll think through how this would work for the legs. Hi Todd! Love the articles! With regards to the omni set you jus talked about I was wondering what possible variations of bodyweight exercises I could include in an omni set for biceps and triceps.. Pull-ups with different grips for biceps? Tricep extensions and chair dips for triceps? Yes, you are on the right track. At home, I have a low pull up bar so I can play around with different positions with my feet on the ground (minor assistance). I’ll have to put together a video on this soon. Used this over the weekend — awesome upper body workout! Not sure what you mean by “nothing between my shoulders” but yes, incline push ups for lower pecs, decline for upper. WOW!!!!!!!! What a workout.I tried my best to do 4 total sets, but my form started to get sloppy towards the end. I’ll definitely make it a point to do this and the leg variation. Awesome Reynaldo! Keep me posted! Hey Todd, I know this article is like a year old, but did you ever create a omni set for pullups?